Ash Soto has taken her rare skin disease and turned it into a "world" of art. 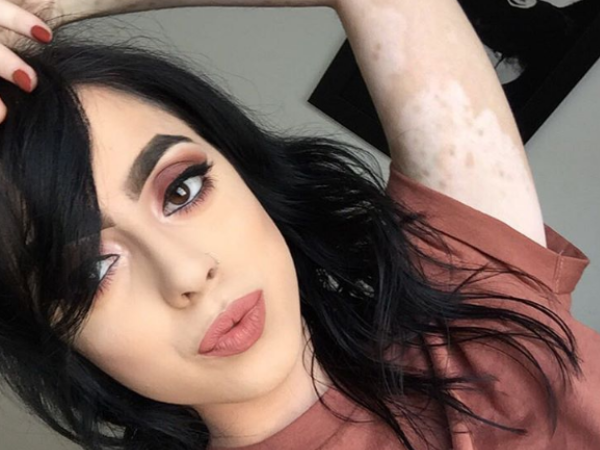 Diagnosed with vitiligo at just 12 years old, Ash had to endure extreme bullying from other kids. She told Buzzfeed that she began covering herself up with clothes after a girl asked her if she had "taken a shower in bleach" after seeing her in a bikini. Nine years later, she is now confident enough to share her condition with the world and the response was more than she could've ever imagined. With over 80 000 followers on Instagram she now shares artistic photographs of herself accompanied with inspiring captions about self-love. "Finally at a point in my life where I can say I love the skin I'm in. It's a learning experience each day but I'm getting there," she wrote on the social network. Paint chronicles ? It was fun being her canvas. Everyone is art, not everyone sees it but with time you will. Confidence doesn't happen with a switch it takes time and you can get there if you just start believing it. Believe you are beautiful. Believe you're worth it. Believe that those quirks that make you who you are is what makes you different. Remember to always stay #bodypositive ? She particularly loves using her body as a canvas by tracing her patches and making them look like continents —dubbing herself 'The girl with the world painted on her body'. Her body art has inspired many woman to love themselves regardless of any "imperfections" they may believe they have. I get stretch marks just like everyone else regardless of if I have a skin condition or not. I go through all the same struggles you all go through that's why I preach self love so much. I don't care if I have to repeat myself in every caption to love who you are regardless if you have tiger stripes, #vitiligo, or whatever the case may be. I'll sound like a broken record each time because at least someone reminded you to appreciate and love yourself unconditionally always ??? Ash is thinking about starting a YouTube channel to connect with her followers on a different level. She also hopes to inspire more people to love themselves regardless of how they may look.